Although I’ve made melty vegan mozzarella cheese before with success, getting the texture just right for a solid mozzarella cheese has been a bit of a challenge. You need the right ratios of agar for firmness, xantham gum for binding, tapioca flour for stretchiness and potato starch or arrowroot for bulk to get that firm-yet-springy texture of real mozzarella cheese. 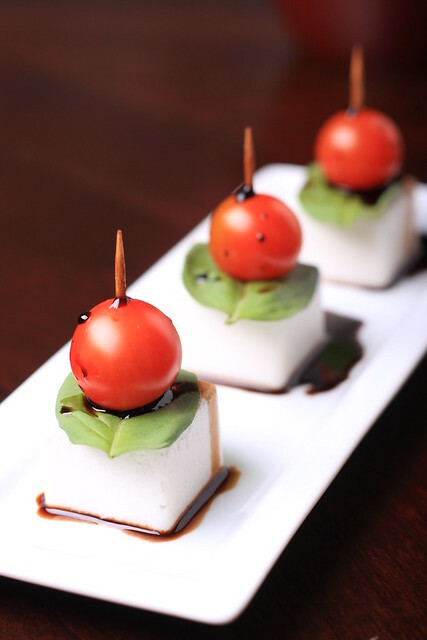 This version hits the mark not only in texture, but also in taste, and looks lovely skewered caprese-style with some fresh basil and tomato, and finished with a few drops of fresh balsamic vinegar. Combine the potato starch and tapioca flour or starch with the water in a small bowl and stir until fully dissolved. Set aside. Heat the coconut milk in a small saucepan over medium heat until it comes to a low boil. While you are waiting for the coconut milk to boil, place the coconut oil and xantham gum in a Kitchen Aid mixer on its highest setting and blend for a few seconds. Once the coconut milk has achieved a low boil, add in the agar powder and whisk briskly until dissolved, then add in the vinegar and salt. Reduce the stovetop heat to its lowest setting, then add in the flour mixture and the xantham gum/oil mixture, whisking very quickly to combine, then transfer to a small-cubed silicone ice cube tray before it gets too thick to pour. Speed with this step is very important. Then place into the refrigerator to fully set for a few hours. 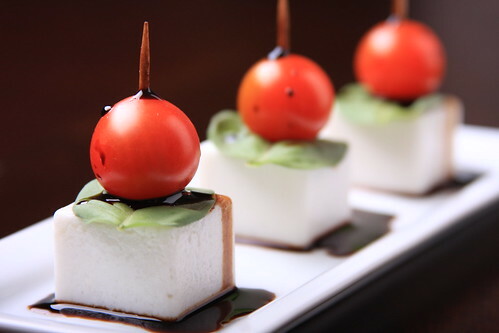 When ready to serve, assemble the mozzarella cubes with the tomatoes and basil leaves on skewers or a toothpick. Spoon or pipe some fresh balsamic vinegar over the top and serve immediately. Oh, wow! This looks amazing… you have my full admiration. Gorgeous pictures, gorgeous recipe. Looks like I need to get my hands on potato starch!.. I'd say you got it. Those are stunning. Oh my! I used to love caprese salad and this would work just perfect! Thank you for another wonderful recipe. Thanks Mary — I hope you enjoy it! wow, you are so amazing. I really need to track down some coconut vinegar and get to work on these recipes you've been posting. They look incredible! I love all the food science fun behind it too! Those look *SO* elegant… and beautifully photographed! I'm so intrigued by your mozzarella! This is definitely going on the to do list. Could the mozza be poured into a larger mold and sliced after, or are the small cubes necessary? Yes, that would work too! Thanks Christine! It's a valid question, and I'm happy to say that, no, coconut is not a pronounced flavor here at all! Once the coconut vinegar hits the coconut milk, it transforms everything into a cheesy, mozz-like non-coconutty flavor. What a different and delicious vegan appetizer! I just ordered a $12 bottle of coconut vinegar specifically to make this! Is there by any chance a substitute for xanthan gum? I have had weird reactions to it in the past – will use it if I have to but would love to avoid it if at all possible. Thank you for the recipe! I'm excited to try it. $12! That must be some fancy-schmancy coconut vinegar, Julie! Totally excited that you are going to try this. You could try to double the potato or arrowroot, or sub guar guam for the xantham gum, but I can't guarantee the same result, as I haven't tried that out myself. Thanks Elle! This is a super-picky recipe, almost similar to baking. All of the components have to be really precise, or it won't work. However! I do recall someone else making the vegan queso dip with apple cider vinegar and it turning out okay, so if you have that around, it may do the trick! Good luck! Erin, I'm curious as to whether you've ever tried making tofu-misozuke? Thanks for sharing that brand, Elle. I've seen all kinds of ranging in pricing for ACV (up to $14! ), but Nature Pacific's sounds reasonable. I've read about tofu-misozuke (I believe The Recipe Renovator did this), but it just sounds so unsafe as a home DIY project — however, if I spotted some pre-made professionally, I'd buy tons of it! You're right, I discovered the tofu-misozuke via your blog link to The Recipe Renovator. What makes you feel it's unsafe as a home DIY project? I was wary of the tofu feta recipe, in which the tofu is left to ferment at room-temperature for a few days, but as the tofu-misozuke remains refrigerated, I figured it would be quite safe(?). The misozuke kind of intimidates me because of the whole mold/bacteria aspect. Even if it is refrigerated, I don't know enough about food safety to this myself. However, I would gladly purchase this made by an expert — it does sound like pretty amazing stuff! I have been meaning to make these for quite some time. Initially, I could not get a lot of the ingredients. Over time I have ordered much of the specialty items online, and then sometimes forget which recipes they were for. Recently, when I referenced your full recipe index I saw the picture and was reminded. Still, I did not have potato starch or arrowroot powder–so I thought I would try with EnerG? I think that may have effected the result just a little–and that I neglected to use a silicone tray *note to self for future* Anyhow, the final result was still quite pleasing despite my own little glitch. I expected to taste more coconut, but did not. The texture was close to the buffalo mozzarella I use in vegetarian recipes and caprese stacks. So for this alone, and the smooth taste, I definitely want to make it again. I will order some arrowroot online, as there were a few little clumps in the cubes that had almost a waxy nougat kind of texture, and I am wondering if that is why, or if I did not whisk and pour fast enough? What do you think? I want to perfect this one because visually it is stunning and a very surprising comparison (coming from an Italian is definitely a compliment). So happy I stumbled on this one again. Served it tonight for dinner alongside your vegan scallops over white wine cream sauce and pasta. Yum! Ener-G as a sub makes sense here, as it contains potato and tapioca starches! The only thing I can think of re: the clumps is maybe it didn't fully dissolve in the water before you added it to the mix? Glad that it was a good experiment — actually cheese making like this is a test/trial-and-error exercise for myself as well — always room for subbing/experimenting to see what you get. Thanks so much for trying this out, Leila! I just tried this out and the texture is a tiny bit soft for my liking, is it supposed to be a softer sort of mozzarella or is there a way I can tweak the recipe to get it a firmer, chewier texture? Lexi, you can up the agar by a tsp, which should give you a firmer texture. If you want it “chewier” slightly up the tapioca and potato/arrowroot by 1/2 TB each … good luck! Awesome, thank you! I’ll give it a try! I have recently turned full vegan, and m missing cheesy pizzas, breads and cheese in general… 😉 this recipe is a hope, although getting xanathan gum and coconut vinegar is challenge, will definitely try and post you a picture! Amazon baby! They have everything. That’s where I get almost everything I buy. I made these for Christmas and they turned out amazing! No one even knew they were vegan. Thank you so much for this recipe! I took pictures, I’m happy to share if you like. After trying many kinds of non-dairy mozzarella and making a few I came across this. This is by far the best! Its got the taste the others including Daiya are missing, although the next test will be on pizza. I did use the guar gum since it was a lot cheaper but can’t imagine this recipe getting any bettet. Made this and was thrilled at how easy it was! (Much easier than making traditional mozzarella.) So .. it was tasty but mine had a pretty strong coconut flavour. Your recipe yielded a lot more than I expected — I got a full silicon tray plus an extra ball about the size of a fist. So I’m brining/marinating the excess in olive brine, olive oil and spices. Will try to remember to update you in a few days in how that worked. Thanks for a great recipe! Glad you found this easy and, yes, the coconut flavor can be mostly neutralized by coconut vinegar, but sometimes it still can come through. Curious to know how your brining/marinating experiment goes! The brining worked very well! The coconut flavor was well-masked (really, obliterated) by the olive juice, olive oil and herbs. I also just made a batch of this with rice milk sted coconut milk — and I added some nutritional yeast to give it that umami hit I think it needs. It already looks like the rice-cheese is going to be chewier, which I also like. However, I can already tell that it has a bit of starchiness/doughiness to it (I just put it in the fridge to start setting, so hard to say how it will end up), which I guess is unavoidable. Thanks for this recipe — really inspiring! Wow, this is really coconut forward. Even the balsamic can’t cover it up. Anita, will you share your brine recipe? Sure, but my brine recipe is pretty … loose. For the best batch, I used the brine from a jar of green olives, a few tablespoons of olive oil, a sprinkle of dried lavender and some salt. Let it sit for about four days, I think? When I took it to a friend’s house, they honestly could not tell it wasn’t “real” cheese. Rice-milk cheese: nope nope nope nope nope. Lavender! I would not have thought of that. I don’t have 4 days, but I can do 2. So… I am going to add a little more agar and potato starch to make it firmer and then brine it. Thank you SO much! Hi. The recipe says to serve immediately, but I need to make about 400 for a fundraiser. Can I refrigerate the cubes for a few days? Janelle, wow, so cool you’ll be making this for that big of a crowd! My very strong recommendation would be to make a test batch first, refrigerate for a few days and see what happens so you can have predictable/consistent results. Good luck! Thanks. I will try that, but potato starch is hard to come by and my Amazon 2-day deliver has now stretched to 7. I’ll be cutting it close! This is a large lunch event that Il Fornaio caters so we volunteers are making “fancy” appetizers. Yours fit the bill! Test batch was way to soft and coconut forward. I am going to increase the agar and potato starch and then brine as per Anita. Thanks, Jill for the tip! Sorry, I did forget to say that refrigeration is not a problem. It is just the same after 2 days. OMG I got it! Erinwyso thank you and Anita and Jill! I just made 100 of the little critters and they are great. I increased the agar, potato starch and vinegar and added 12 drops of smoke flavoring (vegan) for a 5xrecipe batch. They taste like cheese. They have the greasiness and firmness and barely a hint of coconut. These will be a hit. Thank you so much EVERYONE! oh gee, I messed up. I am so sorry. I was cleaning up the kitchen and found I had not added the xanthan gum/coconut oil mixture. The cubes have turned out very nicely without it and I will make the next two batches the same way. Erinwyso, I apologize for corrupting your recipe. Cool! I might consider leaving out the xantham gum/coconut oil next time. I just made this today – I get a noticeable coconut flavor. I was thinking of trying the recipe w/ my homemade cashew milk instead of coconut milk. Am I missing something or are you saying to put a Tbl of coconut oil and a bit of xanthan gum in a Kitchen Aid stand mixer? I mean I have the 6 quart size, but no way it’s going to mix such a miniscule quantity. I am going to try this though. For those who can’t find potato starch, it’s sold for Passover everywhere, so grab some in the spring and it keeps forever. Any store with a kosher section should have it all the time.